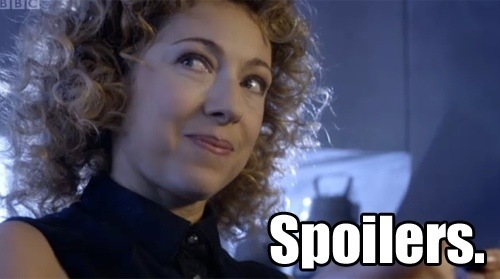 Spoilers: Not just a way of life; also a catchphrase. I have a strong attachment to my many books, but every so often I do lend them out. When I do, I often sell that loan by saying what makes it worth recommending: characters, plot, setting, etc. What I don’t do is say anything along the lines of “Well, it’s the tale of a group of small folk who come into possession of a evil magic ring, and they have to travel across half the world, accompanied by allies from different races, in a quest to destroy it.” Not that I’d be giving away all of “The Lord of the Rings” by doing so, but I’d be depriving the loanee of some of the joy of discovery. So why do movie studios seem determined to go a lot further in spoiling their wares ahead of time? Last night I had the pleasure of watching “The Cabin in the Woods,” the new film from the fertile brains of Buffy alumni Drew Goddard and Joss Whedon. Partly due to the long gap between its filming and release, but mostly due to the creators’ determination to keep as much of it as possible under wraps, I managed to go into the cinema knowing very little of what it was about. This was a very good thing, and I’ll say no more about that film other than that it’s not so much as slasher movie as a movie about slasher movies (and manages to be a lot more fun than its meta-horror precursor Scream). However, it’s getting harder and harder to avoid learning most of what a film has to offer long before its release. I already know more about Whedon’s next movie, The Avengers (or Avengers Assemble if you don’t live in the U.S.) than I’d prefer, and I’ve resorted to sticking my fingers in my ears and shutting my eyes to avoid seeing trailers for Ridley Scott’s forthcoming Prometheus. I do accept a portion of the blame for this. Anyone who trawls the internet habitually can at any moment be enticed by a rumour, press release or teaser trailer. On the other hand, movie studios are always eager to attract more attention for their releases, and media outlets are just as eager to scoop their rivals with the latest unrevealed details of films just over the horizon. The only thing standing in the way of a tidal wave of spoilers is a common awareness that revealing everything ahead of time defeats the purpose of marketing the film in the first place. After years of being a happy consumer of rumours and spoilers, I’ve become a convert to the art of avoidance. I’ll happily watch trailers for, and read about, movies I’ve never heard of in the hope of finding something worth watching, but if it’s something I’m already looking forward to, it goes on my interdicted list. I’d definitely recommend it as a habit to get into. If nothing else, it offers a chance to enjoy a movie twice over: once for the new experience and once again to appreciate the artistry with which it was put together.